Be welcomed to « L'Orangeraie » ! We will be happy to welcome you in a green and peaceful place. 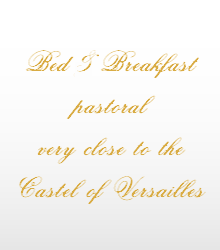 We are situated in Versailles, very close to the castle - 4 or 5 minutes by foot, near bus and railway stations, shops and restaurants. Near the bedroom, the great Castle Park and nature allow our Guests walking, footing, cycling, navigating on the park "Grand Canal", visiting the Castle of king Louis XIV. They can also practice horsing at « Le Haras de Jardy », swimming, canoeing. Paris and all its museums and beauties are very near by train: 12 minutes from the "Les Chantiers" Versailles railway station (one train each 30 minutes), 20 minutes from the "Rive Gauche Château de Versailles" railway station (one train each 15 minutes).